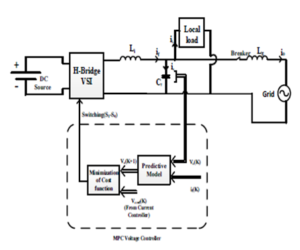 In this paper a novel maximum power point tracking (MPPT) algorithm based on introducing a complex function for photovoltaic systems is proposed. 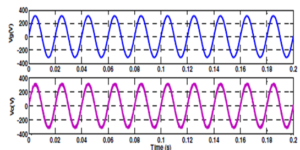 This function is used for determination of the duty cycle of the DC-DC converter in PV systems to track the maximum power point (MPP) in any environment and load condition. It has been suggested based on analyzing the expected behavior of converter controller. The function is formed by a two-dimensional Gaussian function and an Arctangent function. 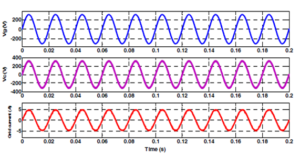 It has been shown that contrary to many algorithms which produce wrong duty-cycles in abrupt irradiance changes, the proposed algorithm is able to behave correctly in these situations. In order to evaluate the performance of method, various simulations and experimental tests have been carried out. The method has been compared with some major MPPT techniques with regard to start-up, steady state and dynamic performance. The results reveal that the proposed method can effectively improve the dynamic performance and steady state performance simultaneously. Fig. 1. Electrical scheme of the system under test. Fig. 2. Output power of PV for battery load in startup test. Fig. 3. The output power and duty cycle in step irradiance change for: (a) VSSINC, (b) LCASF method (c) Fuzzy method and (d) Proposed method. Fig. 4. Response of algorithms to load change. Fig. 5. Response of GAF-VPF algorithm to changes in (a) , (b) , (c) and (d) k.
In this paper a new MPPT algorithm named Gaussian-Arctangent Function-Based (GAF) method was proposed. The method is based on introducing a complex function formed by multiplying a two-dimensional Gaussian function with an Arctangent function. This function is used for generating an adaptive perturbation size. 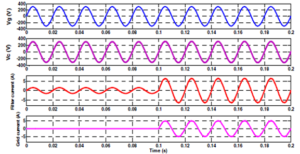 In addition, variable perturbation frequency has been utilized for computing the time of applying the next duty cycle. Simulation results and experimental measurements confirm the attractiveness and superiority of the proposed method with respect to some well-known MPPT methods such as variable step-size Incremental Conductance, load-current adaptive step-size and perturbation frequency (LCASF) and Fuzzy method. The algorithm behaves robustly in case of load variation and measurement noise. The other advantage of proposed method is its simplicity of design. It does not require exact tuning of so many parameters. The only system-dependent constants required for controller setup are open-circuit voltage and short-circuit current and standard condition. Although, the computational cost of proposed method is higher than methods like P&O and Incremental Conductance, it can be easily implemented in low cost micro-controllers. All in all, these features make it well-suited for tracking uncommonly fast irradiance variations like mobile solar applications. Moacyr Aureliano Gomes de Brito, Luigi Galotto, Jr., Leonardo Poltronieri Sampaio, Guilherme de Azevedo e Melo, and Carlos Alberto Canesin, „Evaluation of the Main MPPT Techniques for Photovoltaic Applications”, IEEE Trans. Ind. Electron., vol. 60, no. 3, pp. 1156-1167, March 2013. C. Hua, J. Lin, and C. Shen, “Implementation of a DSP-controlled photovoltaic system with peak power tracking,” IEEE Trans. Ind. Electron., vol. 45, no. 1, pp. 99–107, Feb. 1998. A.R Reisi, M.H.Moradi, S.Jamasb, “Classification and comparison of maximum power point tracking techniques for photovoltaic system: A review”, Renewable & Sustainable Energy Reviews, vol. 19, pp. 433-443, March 2013. 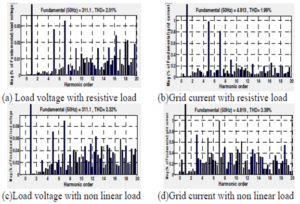 Qiang Mei, Mingwei Shan, Liying Liu, and Josep M. Guerrero, “A Novel Improved Variable Step Size Incremental-Resistance MPPT Method for PV Systems”, IEEE Trans. Ind. Electron., vol. 58, no. 6, pp. 2427-2434, June 2011. N. Femia, G. Petrone, G. Spagnuolo, and M. Vitelli, “Optimization of perturb and observe maximum power point tracking method,” IEEE Trans. Power Electron., vol. 20, no. 4, pp. 963–973, July 2005.